Captain Safia and her crew. 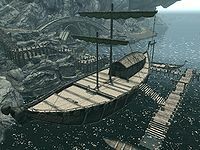 The Red Wave is a pirate ship docked at Solitude. It is commanded by Safia, a pirate captain targeted in a Dark Brotherhood side quest. * These people are essential. The interior of the ship is messy with empty wine bottles left all over the place and many food barrels around the quarters. Upon entering the ships quarters on the deck level you will normally find all of the crew except the captain. There is a stack of food barrels in the northeast corner with a basket on top containing a common book. Against hull to the west is a square wooden table and a couple of chairs, with a cupboard behind holding two potions of minor stamina and two random stamina potions. Against the bulkhead to the south is a second table and chairs. To the left of this is a flight of stairs leading down to the mid deck, with a cupboard holding a bunch of tundra cotton, three bulbs of garlic, a gourd, a single loose septim, a set of fine clothes and a pair of boots directly in front, with a small set of shelves holding four bottles of Nord mead to the left. There are a stack of food barrels further to the left and a door to the right. Through the door is a bedroom containing a double bed in the southeastern corner, with an empty chest at the foot of the bed and a tall wardrobe against the south bulkhead. While against the north bulkhead is a long wooden table and chair. The corridor follows the hull of the ship to the east, with stacks of barrels of food on both sides and a large cupboard holding a knapsack, an iron mace and a woodcutter's axe, with a copy of the Sneak skill book Legend of Krately House on top and a chair beside it against the north bulkhead. At this point the corridor doglegs to the left. Around the corner to the west is the dining area with a long counter against the south bulkhead full of clutter, with a pair of random boots and a potion of minor healing on the floor to the right, by a cupboard that is against the same wall and holds two more potions of minor healing and two random healing potions. Against the hull to the west is a long table with two potatoes, a raw rabbit leg, a pheasant breast, several loaves of bread and pieces of cheese on top. Hanging above this table are two racks holding a total of five whole salmon, with a further three slightly to the right hanging from another rack over some food barrels. Against the north bulkhead is a long wooden table and two chairs, with two portions of grilled leeks, a bottle of wine, a raw rabbit leg, a salmon steak, three seared slaughterfish, two loaves of bread and a goat cheese wheel on top. to the right of this against the east bulkhead is another cupboard. The first room on the right contains two owned single bed and a random mace. There is an end table between the beds with a bottle of wine on top. The last room on the right contains two owned single beds and a random shield. At the end of the corridor is a sleeping area with a total of four single owned beds against the walls, with a set of shelves against the south bulkhead holding two potions of minor healing and a bottle of wine on top and in front on the floor is a potion of minor stamina. The last doorway on the left leads into a room/corridor with a wardrobe and barrel on the immediate left, against the south bulkhead, with a set of shelves holding two pieces of iron ore and four leather strips, with a stack of food barrels to the right with to random potions on top of one of them. On the right as you enter is a long wooden table with a chair in front, with a food barrel to the left and a counter around the corner. Against the hull to the west, which is the side of the ship are a series of sets of shelves. The first holds several mead barrels, a bottle of wine and two bottles of Nord mead. The second holds fifteen iron ingot, a piece of iron ore, four steel ingots, two silver ingots and a leather strip, with a pair of random boots to the right. Further to the right a smaller set of shelves holds a woodcutter's axe, two bottles of Nord mead and an empty wine bottle, with a food barrel to the right with a random shield on top. The last set of shelves is filled with mead barrels, two bottles of Nord mead and an empty wine bottle. At the far end of the ship there are more barrels of food on and under a large shelf at the rear, in front of which is a chair next to a crate with a bottle of alto wine on top, beside a flight of stairs leading down to the cargo deck. The cargo deck is full of food barrels, a single empty chest and a master locked safe the key for which is carried by Sabine Nytte. In the safe, among the other loot is a note from someone named Dyryn. 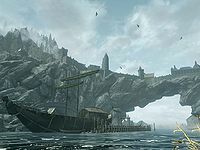 The note mentions a chest under the ship that contains something called balmora blue which is needed for the Thieves Guild reputation quest in Solitude. It can be unlocked using another key carried by Sabine. The chest under the ship doesn't respawn. Redwave was also the name of a unique cutlass in Oblivion, a reward for recovering a family heirloom on a ship haunted by the ghosts of a dead crew during a quest. Incidentally, a member of the Dark Brotherhood was responsible for murdering the ship's crew. It is unknown if there is any intended connection between the two. Crewmembers will not say their usual dialogue to the player while inside the ship and will act as if the player is trespassing but never turn hostile or call for the guards. May be a bug - See talk page.